Pinkerton clapped his hands loudly to get attention from all the explorers gathered in the hall. “Good afternoon everyone. Today we have gathered to celebrate our society’s continued success!” He proclaimed proudly. Some of the more enthusiastic explorers cheered. “Already back in my time, the Renowned Explorers International Society was successful, yet merely starting out. Recently, we not only expanded our efforts into Asia, but we also had four great new explorers with Asian roots join!” Phailin, Hojo and Yu straightened their backs proudly at being called out. Min-Jeong already had immaculate posture, but couldn’t keep a big smile off her face. “I want to thank everyone for ruthlessly, diplomatically and cunningly gathering treasures, fame, funds and research for our society. We have never had more porcelain to decorate our halls with either, despite the fact that some have already been victim to out of control machines, way-ward running explorers and that dog I most certainly didn’t give you permission to bring back.” Pinkerton glared at the ones to blame. Some explorers started looking very innocent. Earl quickly put away the remote control for his Boomcycle he had been fiddling with, resolving himself to not screw up anything during this celebration. He glanced at his partner in crime Yu, who was happily jumping up and down flapping his mechanical wings. So far, still safe... invention-wise. Phailin could only stare in shock at Pinkerton. No Renown?! Anna gave her an enormous grin and twirled her taser in her hand. Harry and Philippe high-fived. Victor thoughtfully stroked his pointy beard and turned to Bia and Agatha to discuss strategy. Kwame, Hildegard, Maria, Pedrinho and Emilia were excitedly gesturing and talking already. Yvonne and Charles were thinking of who they would let tag along with them. Dolores tackled Ivan excitedly and Jan-Piet and Hatice looked on, wondering if they should rescue Ivan. Kiwi poked Molly and together they ran towards the storage for the tastiest supplies. Pinkerton looked on nostalgically, remembering his rowdy days as an explorer. He subtly swept a tear away and looked on proudly at his merry band of explorers. No matter what shenanigans they would come up with, he knew they always would make him and the society proud. The community as a whole has to gather as many resources as possible! Post either a screenshot of your win screen, or of the leaderboards entry for your game. You may even enter the screenshot if you lost. Only one entry per player. You may replace your previous entry. Play on Classic Difficulty. Normal is allowed too, but only if you have never participated in a community challenge before. Everyone in the community will receive the same medal, as per the scoring below. Getting the most Resources as you can is most important for this challenge, renown can take a back seat this time around. Because of this finishing research trees isn't all that important this time, as the renown bonus at the end isn't as useful this time around. 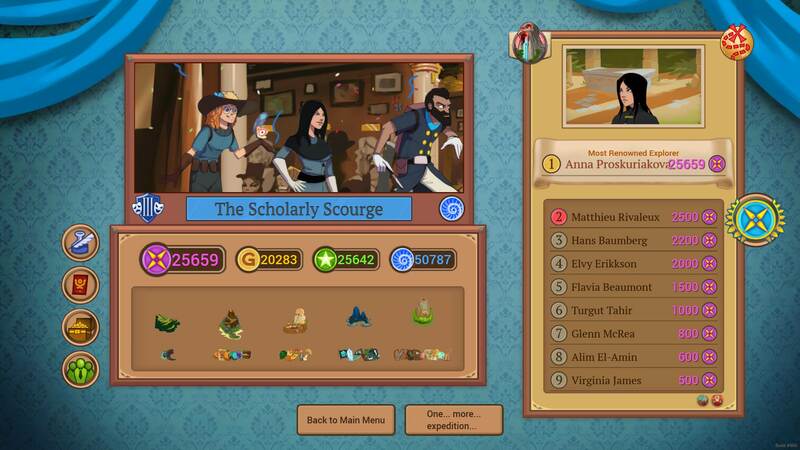 Mix it up and look for the research papers that can give you more tokens or improve their value. The same idea goes for treasures, bonuses such as "1-3 gold on collect" and "3 collect for each level of Beguiler" are good examples of what kind of bonuses you should look for. You can use the Treasure Guide to get a good idea for which treasures you could go for before you depart. Dont forget to make full use of your entourage either, buy plenty helpers to increase the value of the tokens your aiming for. For specialists try to make use of the bonuses they offer, if you recruit Mr. Jenkins for example try to make a character get to lvl 4 Diplomat to get extra campaign token on spins. Story ideas: How many resources will the explorers gather? How do the explorers feel about Renown not being important this time? Have you enjoyed our hundred challenges?